Calligraphy, or beautiful hand-writing, is considered the highest artistic achievement in many Asian cultures. Drawn from the Gallery’s collection and enriched with a significant loan from the Islamic Arts Museum Malaysia, this exhibition showcases diverse calligraphic traditions in both religious and secular contexts, across a range of mediums from the ancient to the contemporary. On display are treasures from the Chinese scholar’s desk such as brushes, pots and holders as well as exquisite works on paper, textiles and ceramics. The art of writing using brush and ink is a marker of cultivation and character for educated women and men in China, Korea and Japan. 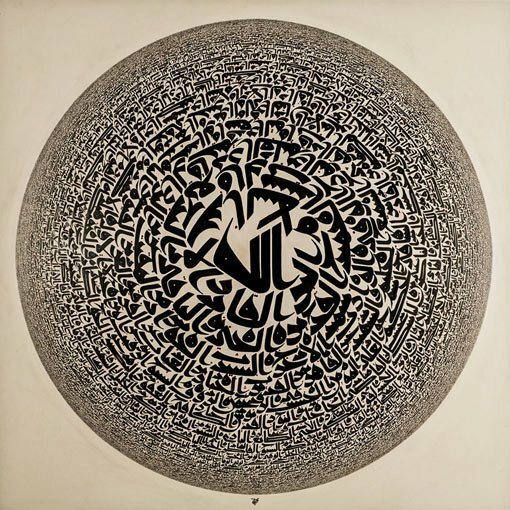 In the Islamic world, where writing the Arabic script is primarily associated with the Qur’an, the practice of calligraphy is seen as a way to express piety. Two interactive contemporary works illuminate the place of calligraphy in art and society today. Persian for kids 2012 by Iranian-born artist Parastou Forouhar gives viewers the chance to practise calligraphy by using zoomorphic script to draw animals. Xu Bing’s Square Word Calligraphy Classroom 1994-96 – which is open for participation 11am-1pm and 2-4pm daily – replicates a classroom where instructions are provided for preparing ink, holding the brush and making brushstrokes.